Some of the destination’s resorts are on the list of top 25 hotels in 2017 in categories including best hotel, best bargain hotels, best service, most luxurious, best for romance and best for families. 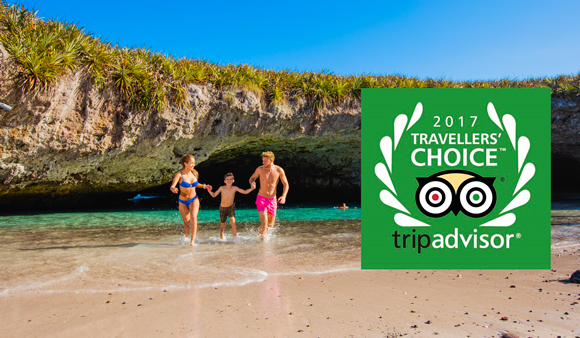 TripAdvisor has published its Travelers’ Choice 2017 where tourists select the top 25 hotels in different categories, and the Riviera Nayarit hotels have their place among the best in Mexico—as they do every year. “We have eight hotels that won a spot in five categories, which speaks to the great infrastructure and excellent service typical of the Riviera Nayarit’s establishments. Congratulations to each and every one!” said Marc Murphy, Managing Director of the Riviera Nayarit Convention and Visitors Bureau. 8th Grand Velas Riviera Nayarit - Nuevo Vallarta. 11th The St. Regis Punta Mita Resort - Punta de Mita. 12th Four Seasons Resort Punta Mita - Punta de Mita. 2nd The St. Regis Punta Mita Resort - Punta de Mita. 9th Grand Velas Riviera Nayarit - Nuevo Vallarta. 15th Four Seasons Resort Punta Mita - Punta de Mita. 19th Sea Garden Nuevo Vallarta - Nuevo Vallarta. 20th Villa La Estancia - Nuevo Vallarta. 22nd The Grand Bliss Grupo Vidanta - Nuevo Vallarta. 23rd The Grand Mayan Grupo Vidanta - Nuevo Vallarta. 11th Hotel Hacienda Flamingos - San Blas. 15th The St. Regis Punta Mita Resort - Punta de Mita. 4th The St. Regis Punta Mita Resort - Punta de Mita. 10th Grand Velas Riviera Nayarit - Nuevo Vallarta. 11th Four Seasons Resort Punta Mita - Punta de Mita.